So this morning I started planning our big yearly entertaining event – the 2017 New Years Brunch. So far I’ve created a Facebook event, built a guest list, started adding to the Pinterest board, built a planning spreadsheet… you know, the usual things when you’re entertaining in 2016? Yeah, all of those. Side note, how did we do this before social media? Wait, what? You don’t do it that way? Whatevs… Paper invites? Spiral notebook lists? In a word… #nope! And with this step I’m making the decision that come what may with the search for work I’m still here and this is where my life is happening. It’s time to make some plans farther out than tomorrow. Life goes on. And if something happens that pulls me out of here then guess what? I know how to fly home. I’m pretty damned good at buying plane tickets in fact and I can get here pretty fast. So everything else be damned… the holidays will be as I wish. Thanksgiving in North Carolina, Christmas and New Years here. Festive, fun, surrounded by people I love in the places I love, with everything I love included. I guess the message I’ve been getting from the voices in my head is “live your life”. Out loud. With no need for any forgiveness or permission. These are most assuredly interesting times indeed but putting everything on hold in order to wait for other people to decide things just isn’t working for me anymore. It’s time for me to just do it. 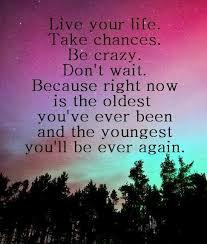 Just live. Today… and tomorrow… and beyond.